The mailman stopped short before the enormous work boot, and looked again at the letter in his hand. It was addressed to Mrs. Mungo Oliphant, Size 99 1’2 EEE, on Drury Lane. It was a pretty big boot, the largest he’d ever seen. 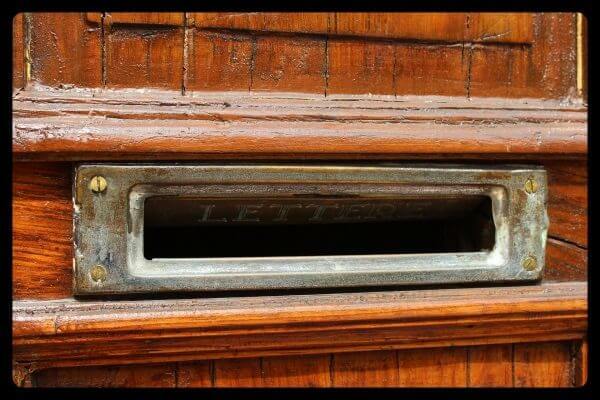 In the front of the toe he found a brass mail slot, just below the doorknob. That a door had been hung in a shoe did not surprise the mailman. After nine years on postal routes, nothing surprised him anymore. Over the next hill, the brothers McSwine had built neighboring houses, one out of straw and one out of twigs. At least the eldest brother Sterling had built his out of bricks. The shoe appeared to be made of weatherproof materials, and it had a nice thick rubber sole. Children were yelling inside the shoe. Given the assortments of howls and squeals, there were quite a few of them. A woman with a mop of tangled red and grey curls stuck her head out of an eyelet and looked down at him. “Are you the mailman?” she asked. Since he was in a mail uniform, and carrying a mail sack, he simply nodded. He could hear a lot of clattering. Evidently the shoe had stairs. After a few moments, the door burst open, and a the woman popped out, smoothing an apron that seemed to be splattered in gravy. She looked somewhere between fifty and infinity, age wise. Lines creased her eyes. The mailman looked at the woman, and the shoe, and then back at the woman. He handed her the envelope, and he could tell by her crestfallen expression it wasn’t what she had been hoping for. “Perhaps Mr. Oliphant will return soon?” the mailman said, offering her his clean white handkerchief. “Ah,” said the mailman, watching the woman blow her nose on his once clean white handkerchief. He could hear the noise of children wailing inside the shoe. There seemed to be quite a few different howls. “There are nineteen little blessings, exactly,” she answered. “Giants don’t do anything by halves. Four sets of triplets, three sets of twins, and one Josephine. The mailman looked at the shoe, and once again wondered how it had been possible for the giant and his wife to do anything at all of that nature, but mailman respect the privacy of their customers. On the other side of the forest, there was a girl living with seven tiny men. Quite a normal looking young woman. But one couldn’t allow himself to wonder. “I never heard of such a thing as giant hair,” the mailman said politely. In a few moments a heavy golden rope of braid came snaking down the front of the shoe. It did look very much like a regular rope, until one looked closely at it. “Josie’s the eldest. My pride and joy,” said the woman. “And her father was a giant?” the mailman asked, as the face of the girl appeared at the end of the braid. She looked normal and human. “He asked you to what?” asked the mailman. “A pretty girl like you must have had a lot of men at the door,” said the mailman, trying to cheer her up. She might have been a beauty in her youth–the bones were good. He was hoping he’d get his handkerchief back so his wife could wash it. He liked his big linen handkerchiefs. “I hate shoes,” the woman said, blowing her nose on his handkerchief. The mailman resigned himself to letting her keep it. He certainly couldn’t put such a nasty article back in his pocket. She retrieved an envelope from her apron pocket. The woman fished in her pocket and produced another stamp and affixed it to the envelope. It had a splatter of gravy on it. “I don’t suppose they’ll care, do you?” she asked the postman. She began to cry again, wiping at her cheeks with the now sodden handkerchief. The mailman tried not to look. Such displays of emotion disturbed him. His wife rarely wept. He had not seen such emotion since Mrs. Dumpty’s husband fell off the wall. “Do you know what I did to the children last night?” the woman said in a low whisper. He was not at all sure he wanted to know. The mailman shifted his pack, and thought about all the deliveries he needed to make. She clenched her hands in her dirty apron. The mailman stared hard at the road, wishing he was walking up a distant hill. Passing the huge shady tree on the right. Far enough away that the shoe was a spot on the horizon. “I’ll make sure that your letter is delivered, Mrs. Oliphant,” he said at last. She extended the mangled handkerchief but he shook his head. Mrs. Mailman had done some fine embroidery, his initials, “M. M.” It seemed a shame, but a greater shame to return it to his wife in his condition. Oh mercy, the mailman thought. Of all the dangerous questions in the universe. Ask me anything else. The mailman hesitated and swallowed. He could hear a small child singing, improbable as it might seem that this older lady had given birth that recently. But stranger things happened in the neighborhood. An old woman had given birth to a baby girl no bigger than her thumb. The child stayed small. Beautiful little lady, studying electronics at university now. He couldn’t say anything older than forty. Even forty was dangerous. But now, in the harsh light when she leaned further in good light, she looked sixty. Or more. “Uh. . .thirty-five?” he said. Her face sagged more, if that was possible. He could see the flood of tears starting again. He watched the unpleasant handkerchief rise to her face once again, now uselessly damp. Mrs. Oliphant slammed the door in his face. As he strode off, he hoped the McSwines were in a less talkative mood, that the wolf who had moved in nearby wasn’t giving them trouble. There was always lots of mail to deliver to the brothers, now that they had discovered internet shopping. He also hoped that Miss Muffet hadn’t fallen off her tuffet again. Lifting her had strained his back. Herodotus wrote that motto, the mailman thought. The old fellow knew everything. He probably had a quote somewhere about not marrying giants. How big would half-giant children grow? He would keep an eye out for the missing boot. She was certain to need more room, even in a 99 ½ EEE. Elizabeth Archer has published short stories, poems and flash fiction. She lives in the Texas Hill Country and is currently working on a novel. For recreation, she tends a garden of poisonous herbs and rescues feral cats.